I Don't Have RockBlades or an IASTM equivalent, I'll get them at the course. I Have RockBlades! or an IASTM equivalent that I will bring them to the course. The cost of this course includes Mohawk kit. You will be able to take these supplies home with you at the end of the course. 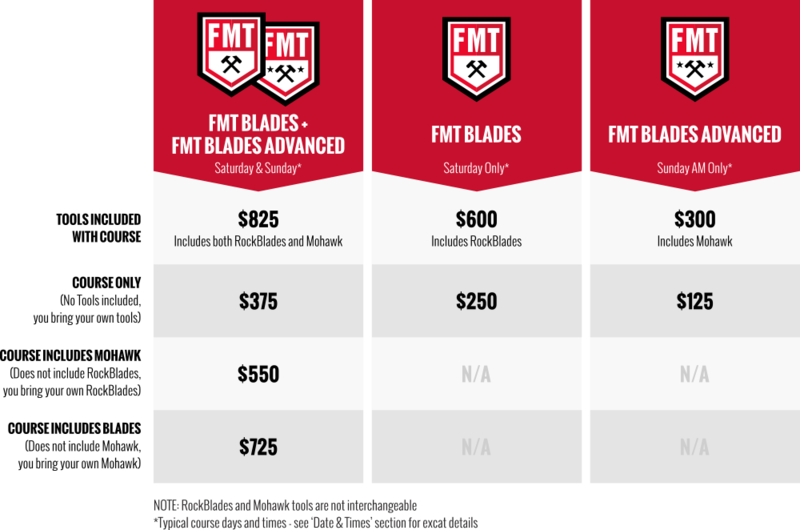 You will be credentialed in FMT Blades, which is a commercially accredited certification. CEUs may be offered for DC, ATC, PT, LMTs and personal trainers - depending on location and class type. PT - 8 CEUs - Course meets continuing education requirements for CO, CT, HI, IN, IA, MA, MI, ME, NB, NH, ND, OR, SC, SD, UT, WA, WY PT Board. AT-Rocktape (BOC Approved provider # P8570) is approved by the Board of Certification, Inc. to provide continuing education to Certified Athletic Trainers. This program is eligible for a maximum of (8 hours/CEUs FMT Blades Category A). ATs should claim only those hours actually spent in the educational program. PT - 4 CEUs - Course meets continuing education requirements for CO, CT, HI, IN, IA, MA, MI, ME, NB, NH, ND, OR, SC, SD, UT, WA, WY PT Board. AT-Rocktape (BOC Approved provider # P8570) is approved by the Board of Certification, Inc. to provide continuing education to Certified Athletic Trainers. This program is eligible for a maximum of (4 hours/CEUs FMT Blades Advanced Category A). ATs should claim only those hours actually spent in the educational program. FMT Blades introduces the concept of movement therapy and performance enhancement via Instrument Assisted Soft Tissue Mobilization (IASTM). The tools may be hard-edged, but the techniques don’t need to be aggressive to deliver superior patient outcomes.The FMT Blades certification will review screening dysfunctional movement patterns and utilizing soft tissue tools to improve patient outcomes. The anatomy, physiology and neurology of myofascial soft tissue work is covered. IASTM intervention strategies will also be combined with kinesiology taping and corrective exercise techniques to deliver a comprehensive approach to patient care. workshop, hands-on environment. This course is intended for practitioners and therapists with all levels of experience with soft tissue techniques. Each participant will keep their soft tissue tool set after this course. Functional Movement Techniques (FMT) Certification courses are led by industry leading experts in movement assessment and therapy. 5. Practice, demonstrate and integrate assisted fascial tooling with functional kinesiology taping to change body-relative movement quality. 6. Understand and demonstrate the ability to provide dry fascial gliding to promote improved ROM. FMT Blades Advanced IASTM Certification introduces the concept of skin/fascial/nerve gliding and neuro-sensory pain* modulation via Instrument Assisted Soft Tissue Mobilization. The tools may be hard-edged, but the techniques don’t need to be aggressive to deliver superior patient and client outcomes. The anatomy, physiology and neurology of myofascial soft tissue work is covered, along with a review of the concept of interlayer connective tissue gliding using a rubber sleeve for added tissue traction FMT Blades Advanced also addresses pain* modulation via specific mechano-reception stimulation using the novel hair comb attachment. This course is intended for practitioners and therapists with a more advanced understanding of soft tissue techniques. Each participant will keep their soft tissue tool set after this course. 3.Recognize and demonstrate skin/fascial glide screening process. 4.Describe and interpret the research of IASTM in respect to connective tissue gliding and pain* modulation. 5.Practice, demonstrate and integrate assisted fascial tooling techniques. 6.Analyze and critique the most common cutaneous nerve entrapments of the upper & lower extremity and trunk. 7.Compare and contrast the ability to provide dry fascial gliding to address cutaneous nerve entrapments.